Pull a plane - Students put away their brushes to tow a 737! Happy Dogs receive warmth and a donation from Jill McKay and Students of the Art Trail Centre! 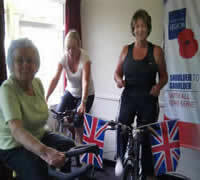 Lotte Evans (left) Jill McKay (right) during their cycle sessions. Students from the Art Trail Centre in Ferndown raise over £300+ towards the Royal British Legion 24 hour indoor Poppy and RBL Ferndown Club cycle challenge. The challenge to ride the equivalent of the mileage from John O'Groats, via Ferndown to Land's end, a distance of 931miles was surpassed with a total of 1000 miles and over £4000+ raised from all sponsors. Tony Birch Chairman commented " I would like to sincerely thank all riders, sponsors, Ferndown Sorts & Leisure Centre, Halfords and Abacus for their contributions. This was a real community effort. The Art Trail Centre student contribution was a real plus - thank you so much"
Having a tug of war can be strenuous but towing a 737 - now that's a challenge which many teams took up. Members of the Art Trail Centre with Jill McKay worked together to pull the 737 over a set distance in aide of the John Thornton Young Achievers Charity and Motor Neurone Association. 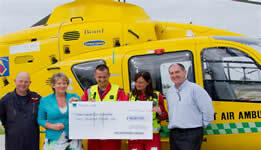 The event raised over £6000 for both charities. Dorset & Somerset Air Ambulance The Art Trail Centre is an Adult Art Academy run by Jill McKay and her Husband Brian Wells in Ferndown Dorset. Each term, in addition to running their daily classes, they undertake their own charitable initiatives to raise funds for local charities and deserving associations. These are derived from donations, raffles, auctions of Jill�s paintings which have been donated to various organisations, and proceeds from outdoor painting days. 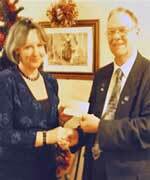 Funds are then distributed across the various chosen charities. 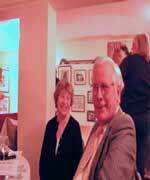 Jill McKay commented � fund raising is a vital part of our ethos and commitment to the local community. 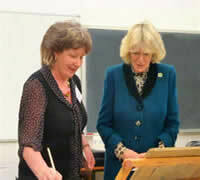 DUCHESS OF CORNWALL VISTS WI Duchess of Cornwall meeting staff at Denman College and meet WI members Duchess of Cornwall, Denman College, WI Photo by: Damian Halliwell Duchess of Cornwall meeting Jill McKay, who taught her how to paint a sunset in acrylics at Denman College Duchess takes a masterclass at WI college 10:00am Wednesday 23rd February 2011. The evening was packed with supporters of the NSPCC at the annual Charity fund raising event. 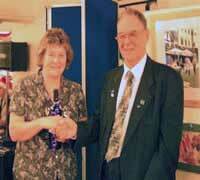 Jill McKay painted a local Sandbanks sunset scene which was auctioned to raise valuable funds for the charity. Esther commented " This painting is really lovely, I wouldn't mind having this hanging in my house". HRH Princess Anne formally opened the RNLI offices in Poole and was also treated to an exhibition of Art from Jill McKay who was exhibiting in the main exhibition areas with a variety of subject, media and styles on show. The Princess Royal took time to view every painting and enjoyed the 'colour' of the day. The exhibition was a great success with many paintings sold. 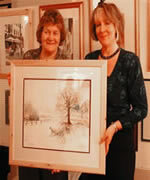 Jill McKay�s Art Trail Centre students in Ferndown have successfully raised �250 for charity at their annual Christmas charity draw, Students donated over 60 prizes, and the main draw prize was an original Charles Evans watercolour which was kindly framed by Bruce Songhurst of West Moors. David Barr from Corfe Mullen who won the painting said � I am staggered and delighted to have won. � He went on to say, �After returning to join one of Jill�s workshops recently I felt so relaxed and at home that I have decided to book a January course. I didn't get good marks for art at school, and what Jill has taught me most is that I am capable of producing good results.� Part of the proceeds will be donated to the local charity �Coping with Chaos� which provides support and activities for families with disabled children. The Oakhaven Hospice in Pennington recently received a cheque for �175 from Jill McKay who runs adult art classes at �Jill McKay�s Art Trail Centre� in Ferndown. Many of Jill�s students kindly donated items for sale to raise money and awareness of the Hospice, which Jill chose to support, after visiting to see the high quality of care provided for both day visitors and short term residents of the surrounding area. 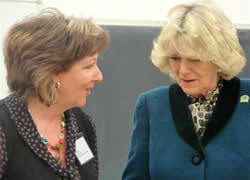 Jill said � Pennington is only 20 minutes from Ferndown � although our students travel to us from many areas of the country it is always a pleasure to help charities which are close to the student�s hearts wherever they live; particularly those charities which rely on public support to survive. Oakhaven Hospice provides a community-based specialist palliative service, caring for over 120 patients, their families and carers each week. It costs �2 million to provide this service each year with just 21% of the funding from the NHS.� Estelle Drew-Wills from the Hospice said �On behalf of the patients and staff at Oakhaven I would like to thank Jill and Rochelle for their excellent fundraising work. 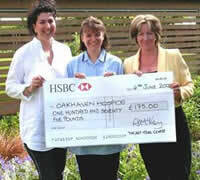 We are delighted to receive this cheque and greatly appreciate their support.� Oakhaven have many fundraising events planned for the Summer, in particular ~Evening Jazz on Saturday June 18th and a Mozart Opera on July 9th, both to be held at the beautiful Walhampton school in Hordle. ‘Happy Dogs’ of Kingston near Ringwood received a cheque from Jill McKay of the Art Trail Centre in Ferndown, as a result of a charity raising event organised by Jill and her husband Brian. On arrival Jill & Brian handed the cheque along with towels donated by Jill’s students to Lyn Williams who runs the Centre. 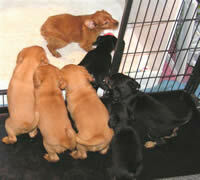 They were all greeted by seven little happy faces belonging to some newly arrived King Charles cross puppies. Lyn thanked Jill and the students from the Art Trail Centre saying “we are always looking for foster and permanent homes for the many dogs we have; of the seven gold and black puppies there are three beautiful golden boy puppies who are still looking for a new mum and dad to give them a good home”. Lyn also has other older dogs which are house trained and looking for a loving person or family, if you are interested in learning more or offering help please contact Lyn on 01425 477676. Jill McKay of the Art Trail Centre in Ferndown will be demonstrating many techniques used within her 'Successful Technique' courses and workshops at HobbyCraft in Longham, Ferndown on Sunday 6th September from 11.00am-4.00pm. Visitors are invited to sit and enjoy the sessions which are free of charge and run continuously throughout the day. Watercolour Demonstrations & Commissions with Jill McKay - at Jacardi - Ferndown Jill McKay of the Art Trail Centre in Ferndown will be providing free painting demonstrations for Jacardi customers throughout the day. Customers will be able to watch or bring along their favourite photographic scene and have these painted by Jill for �35-40 whilst they wait. Alternatively, a choice of Jill's photographs will be available to paint your favourite scene. "This is a very unique joint offering from Jill McKay and Jacardi Furniture commented Richard Blunderfield, joint proprietor of Jacardi. Painting commissions for Homes or Offices will also be taken on the day. Demonstrations commence from 10am - 1230pm & 1-4.00pm. In addition a number of Jill McKay's paintings are available to view or buy and these may be seen at Jacardi Furniture 12 Victoria Road, Ferndown during normal opening times throughout each week. Visitors are invited to enjoy the sessions which are free of charge and run continuously throughout the day. Mr John Collins addresses the group of Artists at the Ringwood Art Society Ringwood Art Society Over 70 local members and guests of the Ringwood Art Society crowded the room to enjoy a very successful interactive demonstration evening with Jill McKay on Gouache and mixed media. Jill McKay commented �We had a lovely evening covering quite a variety of options and techniques. Looking at different mediums and combining these for effect is important for developing artists to understand Gouache and how they can use this media to create or enhance many of their paintings". The evening was videoed and projected to enable all members to enjoy the techniques demonstrated. Pam Mason-Smith, Chairman of Ringwood Art Society announced the forthcoming painting holiday with Jill McKay in France, and John Collins rounded off the evening by thanking Jill for her interesting presentation, saying that he and many members now have many new ideas on the use of Gouache and are now inspired to give them a try. Classes at the Art Trail Centre - Ferndown run most days and Tuesday evenings; with Watercolour workshops on Wednesday mornings and Acrylics on Friday afternoons. A comprehensive website provides more information and can be visited at www.arttrailcentre.co.uk. Charity Night - During the afternoon and evening over 70 students and friends of Jill McKay's Art Trail Centre, attended a wonderful Charity evening of social contact with each other, the opportunity to win one of more than 75 donated prizes, plus a chance to win an original Jill McKay painting. The raffle prizes where donated by the students, Artcetera, Ken Bromley Supplies, Knoll Gardens, Kingston Lacy, The Bridge House Hotel, Profile 2000, Dudsbury Golf Club and Stapehill Gardens. "I would like to publically extend my thanks for their generosity. without their help and support, this evening would not have been so successful " said Jill McKay. The evening saw a number of student paintings sold, a percentage of the sales plus "show fee" will be donated to Happy Dogs. Jill said "at this time of year Happy Dogs especially needs all the help they can get". Mrs Stephanie Bradshaw, winner of the Jill McKay painting The evening continued with music from Mosaic Jazz to ensure the Christmas spirit prevailed. - Mrs Stephanie Bradshaw, winner of the most interesting picture was chosen by Mr C Ricketts. 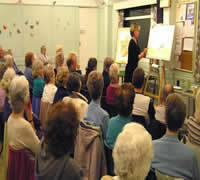 Jill McKay's Art Trail Centre About Contact Bookings Demos Calendar Holidays Classes Tutor About Press Releases Jill McKay's Art Trail Centre� Press Releases Hengist Art Society Hengist Art Society Nearly 50 local members of the Hengist Art Group crowded the room to enjoy a demonstration evening with Jill McKay on exploring painting without drawing. Jill McKay commented �We had a lovely evening, it is so important for developing artists to understand that whilst drawing is often used before painting, occasionally painting directly on to the paper can be a useful method for all.� Jill also exhibited other paintings which had been completed without drawing. Caroline Gribble, Chairman of Hengist Art Group, rounded off the evening by saying she knew and loved Jill�s painting style, had previously attended some of her workshops and was looking forward to a return visit. 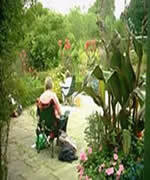 Landscape Workshops this term at the Art Trail Centre are mainly in Watercolours. Classes run most days and Thursday evenings. 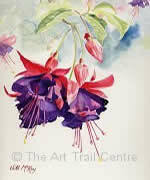 A comprehensive website provides more information and can be visited at www.arttrailcentre.co.uk. Enquires can be made by either calling Jill on 01202 877 369 or email ENDS For more information please contact 01202 877369, email or visit the website www.arttrailcentre.co.uk Jill McKay's Art Trail Centre The Art Trail Centre� situated in Ferndown Dorset, is an Art School providing adult education to both individuals and groups of mixed ability classes. 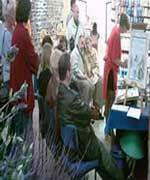 The Art Trail Centre began in early 1992 as a structured response to local requests for specialised art tuition. It quickly expanded when many more students began joining, and the classes moved location from smaller sites in the surrounding areas to its present location in Ferndown. 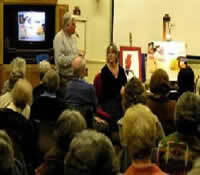 Mediums include Watercolour, Pastel, Gouache, Pen & Ink, Chinese Brush Art, Acrylics, Drawing and Mixed Media. The Centre also provides Adult Education tuition via Dorset Adult Education Centre's within the local region. 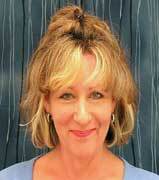 Resident full time art tutor is Jill McKay. Style - strong and delicate. Freestyle but clearly recognisable. Art Tuition, Adjudication, Critique, Public Speaking is additionally provided to the Women's Institute at Denman College, local W.I. groups, Private Groups and Art Societies. Demonstrates for Hobby Craft, Pebeo and Winsor & Newton. Painting Holidays and Weekend 'Breaks Away' are also a key feature of the Art Trail Centre's service. Since its conception, the Centre has provided a diversity of topics to regularly satisfy demand from all levels of amateur artists. Each year sees brand new material for courses, workshops, outdoor painting days and painting holidays, Jill McKay is constantly planning new ideas for the future to develop the skills of new and current students. Jill McKay comments "We aim to provide progressive learning through our "Successful Techniques" Classes/Workshops and a fun environment to ensure our students develop their artistic skills in a relaxed way." "Two years at the Art Trail Centre, with tutorial guidance from Jill McKay has opened up many aspects, in application and varied methods of Watercolour Painting. Come and give it a go, I really enjoyed myself " commented Pam White, one of Jill's Students. Tutor Availability - Advanced booking during term time, weekends during the summer holidays. Fees and expenses - appropriate to event. Adult A- level and GCSE classes. 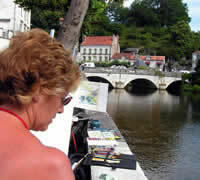 Pam Murray, a student of the Art Trail Centre, Ferndown enjoying a scene in the Dordogne. 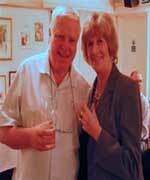 Jill McKay with the Mayor of Brantome, Monsieur Guy Duvivier, at her exhibition of paintings in France. Jill McKay of the Art Trail Centre in Ferndown held her Summer Exhibition in France, which was opened by the Mayor of Brantome, Monsieur Guy Duvivier. Over 100 people attended the opening night, to view the many pictures and styles. The nine day event was attended by several hundred people. In his opening speech Monsieur Duvivier said "I am extremely pleased to see so many wonderful paintings and different styles, I do so hope Jill will return again." Jill will be exhibiting locally at Wimborne in October/November and at the Bridge House, Longham in December . The Art Trail Centre is currently enrolling for September Workshops and Courses. For details of these and further events call Jill McKay at The Art Trail Centre on 01202 877369. ENDS For more information please contact 01202 877369, email or visit the website www.arttrailcentre.co.uk Jill McKay's Art Trail Centre The Art Trail Centre� situated in Ferndown Dorset, is an Art School providing adult education to both individuals and groups of mixed ability classes. The Centre also provides Adult Education tuition via Dorset Adult Education Centres within the local region. Resident full time art tutor is Jill McKay. Style - strong and delicate. Freestyle but clearly recognisable. Art Tuition, Adjudication, Critique, Public Speaking is additionally provided to the Women's Institute at Denman College, local W.I. groups, Private Groups and Art Societies. Demonstrates for Hobby Craft, Pebeo and Winsor & Newton. 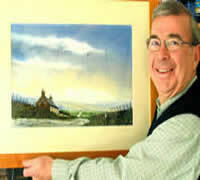 Painting Holidays and Weekend 'Breaks Away' are also a key feature of the Art Trail Centre's service. Since its conception, the Centre has provided a diversity of topics to regularly satisfy demand from all levels of amateur artists. Each year sees brand new material for courses, workshops, outdoor painting days and painting holidays, Jill McKay is constantly planning new ideas for the future to develop the skills of new and current students. Jill McKay comments "We aim to provide progressive learning through our "Successful Techniques" Classes/Workshops and a fun environment to ensure our students develop their artistic skills in a relaxed way." "Two years at the Art Trail Centre, with tutorial guidance from Jill McKay has opened up many aspects, in application and varied methods of Watercolour Painting. 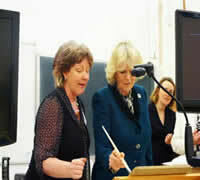 Come and give it a go, I really enjoyed myself " commented Pam White, one of Jill's Students. Tutor Availability - Advanced booking during term time, weekends during the summer holidays. Fees and expenses - appropriate to event. Adult A- level and GCSE classes. 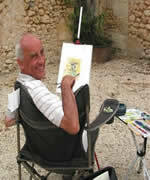 Tony Hewitt, a student of the Art Trail Centre, Ferndown enjoying a restful day painting in the enchanting Dordogne. Jill McKay Jill McKay's Art Trail Centre The Art Trail Centre� situated in Ferndown Dorset, is an Art Academy providing adult education to both individuals and groups of mixed ability classes. The Art Trail Centre began in early 1992 as a structured response to local requests for specialised art tuition. It quickly expanded when many more students began joining, and the classes moved location from smaller sites in the surrounding areas to its present location in Ferndown. 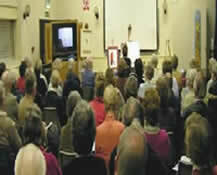 Mediums include Watercolour, Pastel, Gouache, Pen & Ink, Chinese Brush Art, Acrylics, Drawing and Mixed Media. The Centre also provides Adult Education tuition via Dorset Adult Education Centres within the local region. Resident full time art tutor is Jill McKay. Style - strong and delicate. Freestyle but clearly recognisable. Art Tuition, Adjudication, Critique, Public Speaking is additionally provided to the Women's Institute at Denman College, local W.I. groups, Private Groups and Art Societies. Demonstrates for HobbyCraft, Pebeo and Winsor & Newton. Painting Holidays and Weekend 'Breaks Away' are also a key feature of the Art Trail Centre's service. Jill McKay Jill McKay's Art Trail Centre The Art Trail Centre� situated in Ferndown Dorset, is an Art Academy providing adult education to both individuals and groups of mixed ability classes. The Art Trail Centre began in early 1992 as a structured response to local requests for specialised art tuition. It quickly expanded when many more students began joining, and the classes moved location from smaller sites in the surrounding areas to its present location in Ferndown. 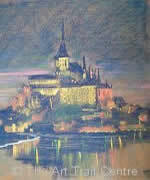 Mediums include Watercolour, Pastel, Gouache, oils, Pen & Ink, Chinese Brush Art, Acrylics, Drawing and Mixed Media. Since its conception, the Centre has provided a diversity of topics to regularly satisfy demand from all levels of amateur artists. Each year sees brand new material for courses, workshops, outdoor painting days and painting holidays, Jill McKay is constantly planning new ideas for the future to develop the skills of new and current students. Jill McKay comments "We aim to provide progressive learning through our "Successful Techniques" Classes/Workshops and a fun environment to ensure our students develop their artistic skills in a relaxed way." "Two years at the Art Trail Centre, with tutorial guidance from Jill McKay has opened up many aspects, in application and varied methods of Watercolour Painting. Come and give it a go, I really enjoyed myself " commented Pam White, one of Jill's Students.